-I have the full permission of Napisal to share his mods! -Do NOT sell our mods or parts of it! -If you use our mods as a base for your mods, Napisal & I would be happy about credits. -If you want to use our mods as an addition for your mods or (server) modpacks, please contact me first. -Feel free to share pictures or videos about our mods, but credits would be nice here too. -You are allowed to modify our mods in any way for your personal use. -Napisal﻿ for creating this mod & for all the time he has invested to figure out how Frostbite works. Without him I would not even know about BFBC2 modding, so make sure to support him! Note: This mod was created by Napisal﻿ and is normally a part of his Client Mod Pack﻿! I only took a part of his mod pack, made it standalone and compatible with BFBC2 Mod Loader﻿ and therefore also compatible with my mods. I have the full permission of Napisal to share his mods! 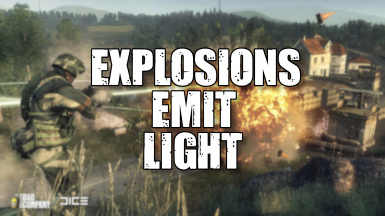 This mod modifies & affects the base game & Vietnam add-on! Do you want to discuss about mods and BFBC2 in general? Or find people to play with? Join UNITY Gamers Forum﻿ and UNITY Gamers Discord﻿. -Vehicle HUD Overhaul﻿ by me - changes a few graphical aspects of the vehicle HUDs. No scanlines, no grain/noise, less drastic color grading & more. -No Bad Filter﻿ by me - Overhauls the post processing & lighting effects of the base game maps to achieve a more realistic & natural look. -Menu Mod﻿ by Napisal - Removes startup intros and changes the menu soundtrack to the memorable BC1 soundtrack. -MASE by flyer8472 - A server emulator to run a server on your local PC and play offline against bots etc. For more BFBC2 mods and information, visit Venice Unleashed﻿ & UNITY Gamers﻿!